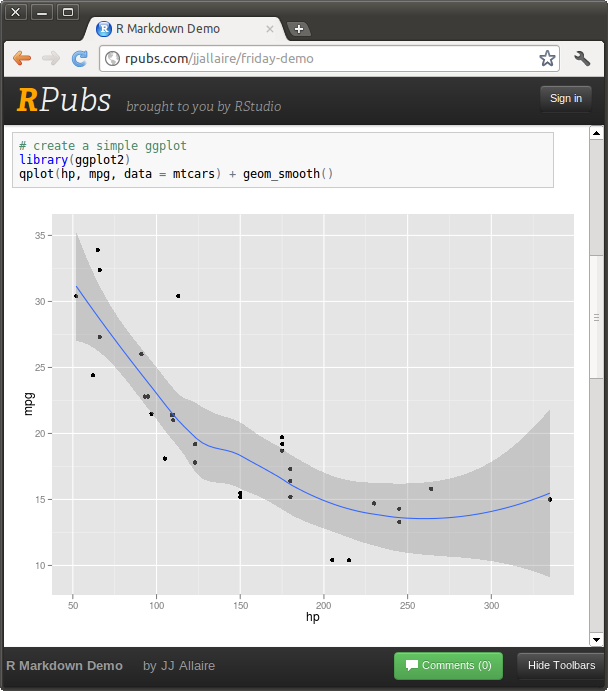 Today we’re very excited to announce RPubs, a free service that makes it easy to publish documents to the web from R. RPubs is a quick and easy way to disseminate data analysis and R code and do ad-hoc collaboration with peers. RPubs documents include a moderated comment stream for feedback and dialog with readers, and can be updated with changes by publishing again from within RStudio. Note that you’ll only see the Publish button if you update to the latest version of RStudio (v0.96.230, available for download today). RStudio has integrated support for working with R Markdown and publishing to RPubs, but we also want to make sure that no matter what tools you use it’s still possible to get the same results. To that end we’ve also been working on a new version of the markdown package (v0.5, available now on CRAN). The markdown package provides a standalone implementation of R Markdown rendering that can be integrated with other editors and IDEs. The package includes a function to upload to RPubs, but is also flexible enough to support lots of other web publishing scenarios. We’ve been working with Jeff Horner on this and he has a more detailed write-up on the capabilities of the markdown package on his blog. Let us know what additional examples you’d like to see—we’ll be adding more in the weeks ahead.